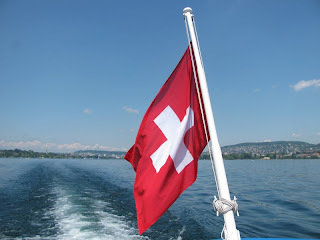 We've made it back from Zürich and had a wonderful time. The city is beautiful and relaxed...and just what the doctor ordered after a busy semester and year! 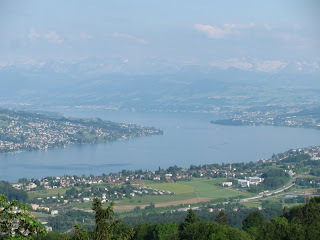 If you ever get a chance to visit, I highly recommend it--it's right on a lake and has plenty of places of interest both in the city and in the surrounding countryside. 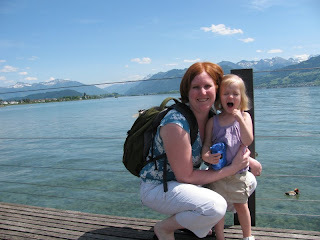 And a picture of my daughter and I in Rapperswil, a small town on the other side of the lake (with a great view of the Alps, by the way!). I think Sophie was trying out a fake laugh in this picture. The next couple of weeks are going to be busy ones for us (lots of visitors and a new batch of students), so I may not post as often as usual, but I do have a couple of tasty posts in the works! I love the water shots! I grew up near the water fishing, although it was man made lakes, but now when we travel it has to have water! You know I told you hubby is upset you are moving back, lol, he thought "Wow we would have someone to visit if we went over this fall"... Glad you are making the most of it! It looks beautiful, my husband has always wanted to visit! 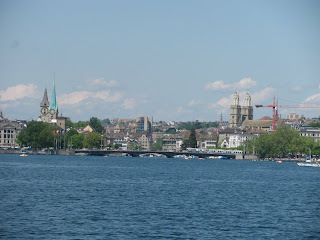 Zurich looks lovely! I have never been, but I have aunts there so I hope to go some day. Glad you had a nice trip! Your pictures are beautiful!